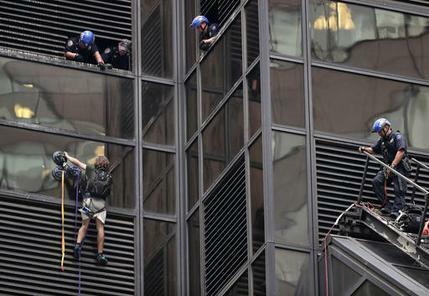 NEW YORK (AP) -- A man who wanted an "audience" with Donald Trump spent three hours scaling the glass facade of Trump Tower on Wednesday using large suction cups, climbing as high as the 21st floor before police officers grabbed him and hauled him to safety through an open window. The climber, identified by police as a 20-year-old Virginia man, wore a backpack and used a harness and rope stirrups to fasten himself to the side of the 68-story Manhattan skyscraper. For a long time, the climber played a slow-motion cat-and-mouse game with would-be rescuers. Officers smashed windows and broke through ventilation ducts to block his progress. Police also lowered themselves toward him using a window washer's platform. The man kept his distance by methodically working his way back and forth across the facade, repeatedly repositioning suction cups resembling a type commonly used by window washers to remove big panes of glass. The chase ended dramatically just after 6:30 p.m.
As a crowd gasped on the street below, two officers leaned far out of a window, grabbed the climber's arm and harness, and in a flash yanked him from his dangling stirrups. He went through the opening head first, his legs pointed skyward. "I reached out. I took hold of his hand and I said, 'Sir, would you come with me,'" said detective Christopher Williams, who made the grab. Police had deployed large, inflated crash pads at the scene, but it was unclear how much protection they would have offered if the climber fell. A day before the ascent, police said the climber posted a video on YouTube entitled, "Message to Mr. Trump (why I climbed your tower)." He posted the video under the name Leven Thumps, which is a character in a series of children's fantasy novels by the writer Obert Skye. NYPD Assistant Chief William Aubrey said the man, who was not named by police, told officers the same thing after he was safely inside the building. "At no time did he express that he wanted to hurt anybody," he said. The tower is headquarters to Donald Trump's Republican presidential campaign and his business empire. Trump also lives there, though he was in Virginia in the afternoon and was headed to Florida for an evening event. A Trump campaign spokeswoman didn't immediately respond to a request for comment. "This man performed a ridiculous and dangerous stunt," Michael Cohen, an executive at the Trump Organization, said in an emailed statement. "I'm 100 percent certain the NYPD had better things to do." Later Wednesday evening, Trump tweeted "Great job today by the NYPD in protecting the people and saving the climber." The climber began his ascent from a terrace that is open to the public during the day. Police said he was taken to a hospital to be evaluated. This story has been corrected to show that Trump Tower is a 68-story skyscraper, not a 58-story one. 0 Response to "POLICE GRAB MAN CLIMBING TRUMP TOWER IN NEW YORK CITY"